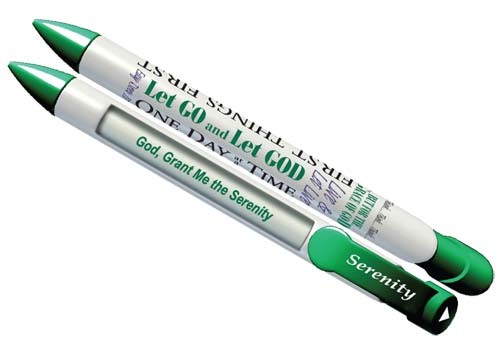 These incredible Recovery Pens magically rotate through each verse of our Serenity Prayer with every click of the button! A fantastic gift item for anyone in the program! Perfect for the group supply box! Message 4: and Wisdom to Know the Difference. These Serenity Prayer Pens feel great in the hand! Well balanced with a slightly thicker body than standard ball point pens - they write very well! These are not your average plastic disposable pens! All Serenity Pens are 1mm ballpoint, retractable pens with black ink.